Paul Hletko founded FEW Spirits in 2011, in Evanston, Illinois just 30 minutes north of downtown Chicago. Being based in Evanston, a stronghold of the American temperance movement, FEW gets its name from the initials of Frances Elizabeth Willard, the president of the Women's Christian Temperance Union. In their typical tongue and cheek style, the label of this bottling for That Boutique-y Gin Company shows the ghost of Mrs. Willard haunting Hletko for attaching her name to a distillery. Heltko makes the base spirit for his gin from a mash of corn, wheat and unmalted barley. FEW's American Gin is made with 11 botanicals, among which are juniper, lemon peal, orange zest, vanilla, cassia, grains of paradise and brewers hops. However, for this bottling by That Boutique-y Gin Company they tweaked the botanical mix to include juniper, coriander seed, lime, and fennel. Nose: The nose is super fruity with notes of apple and strawberry right up front. Underlying the fruit character are notes of lemon grass and juniper. Palate: On the palate the gin is very smooth. The flavor has notes of lemongrass that transforms into lemon zest and there is a slight note of dill on the back palate. Finish: The flavors on the finish taste like fruity bubble bum followed by a slight briny character layered with dill and sweet lemon. Conclusion: FEW Spirits Batch 1 Gin is a fascinating gin that clearly displays how making your own base spirit rather than buying neutral spirit in bulk can enhance the character of the gin. This Batch 1 Gin is so unique that it could be off putting to those looking for either your standard juniper forward gin or the common floral/citrus forward gin. Be advised this is not your standard gin, that being said it the range of flavors an complexity is intriguing. While sampling this gin the first thing that came to mind was that it would be excellent served slightly chilled with spicy Thai food. This is definitely a gin to be creative with. In preparation for the upcoming Negroni Week (June 5-11, 2017) I decided to create a few Negroni variations with some of the gin in my liquor cabinet and see how the drink changed. The classic negroni is equal parts gin, sweet vermouth and Campari. For these variations I used Alessio Vermouth di Torino Rosso, Campari and three different aged gins. Negroni #1: This was made using FEW Spirits Barrel Gin (46.5% ABV) which is an aged gin distilled with an undisclosed number of botanicals which includes juniper, bitter orange and lemon peel, cassia and angelica. As a negroni the noise was woody, with fruity bubble gum notes. The Negroni tasted of sweet berries and orange with a strong whiskey character. The finish started sweet, dried out from the wood tannins and closed with notes of black pepper grapefruit zest, charcoal and menthol. Negroni #2: This was made using High Wire Distilling Hat Trick Barrel Rested Gin (44% ABV) which is an aged gin distilled with crushed juniper berries, fresh lemon and orange peel. As a negroni, the sweet vermouth came through on nose with bright citrus from the Campari. The flavor was a dance of sweet spicy and bitter. The finish started strong with juniper and faded into bitter grapefruit and sweetness. Really nice. Negroni #3: This was made using Old World Spirits Rusty Blade Single Barrel-Aged Gin (60% ABV) which is an aged gin distilled with 11 botanicals including cilantro, coriander, cardamom, cinnamon, ginger, black pepper, orange, lemon, tangerine and steamed juniper. As a negroni the nose had notes of sweet cherry and fresh orange. The cocktail tasted of maraschino cherry, sweet grapefruit, and mid palate spice notes of clove and cinnamon explode with slight bitterness. The finish was spicy dry and mildly bitter with notes of juniper and grapefruit zest. Life is good...so good in fact I haven't had a chance to post anything new for awhile. 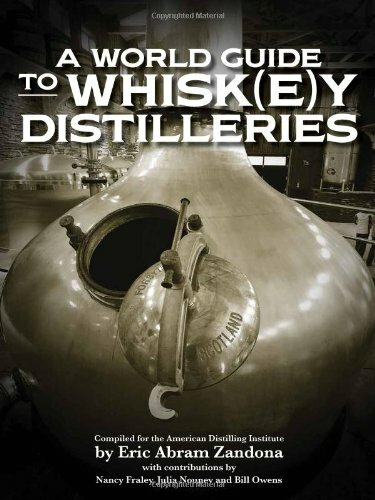 The first piece of exciting news is that the book I helped write A World Guide to Whisk(e)y Distilleries has been published by White Mule Press, the publishing arm of the American Distilling Institute (ADI). I came onto the project about a third of the way through and saw it to completion. The book attempts to list all the commercial whisk(e)y distilleries in the world, from Alaska to Zimbabwe and the products they make. So if you are an avid whisk(e)y enthusiast that likes to visit distilleries or you want to know where your favorite product is made you'll probably find this useful. I'm excited that I have a couple more book projects lined up with White Mule Press but at present I have been busy editing two books for them, one on gin and a second on rum production. These projects have been particularly demanding of my time which is partially why I haven't posted anything recently. The other piece of exciting news is that I attended the 10th Annual ADI Spirits Conference & Vender Expo, that this year was held in Denver. The conference brought together about 900 distillers, soon to be distillers, and the still, label, glass, barrel and branding vendors that service the craft distilling industry. It was a blast to meet both new and seasoned distillers who were passionate about their craft and committed to growing successful businesses. One of my highlights from the conference was sitting in on David Smith's gin tasting. David writes for a number of publications as well as his site Summer Fruit Cup. We tasted some stand out gins from the US, UK, and France. If you're a big fan of gin a couple to look out for are FEW Barrel Aged Gin and Warner Edwards Harrington Dry Gin. During the gala dinner ADI announced the results from their 7th Annual Judging of Artisan American Spirits. The Best of Class winners were: Ballast Point Spirits, Devil's Share Malt Whiskey; Valentine Distilling Company, Liberator Gin; Balcones Distilling, Texas Rum; Ole Smoky Tennessee Moonshine, Apple Pie Moonshine; and Jepson Vineyards, Old Stock Mendocino Brandy. For the full list of winners check out ADI's website. Now that I'm back from Denver I hope to get back into my routine of posting once or twice a week.